We don't know how many sales the new Turing-based GPUs NVIDIA has made but it certainly has generated a lot of reviews. 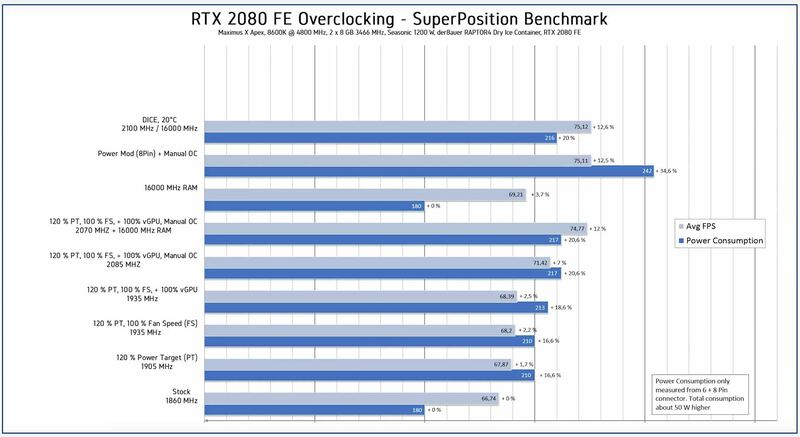 [H]ard|OCP have been working hard on overclocking the Founders Edition RTX 2080 and recently published their findings. They tried three different methods; simply setting the fan to 100%, running NVIDIA's new scanner tool, which does not void your warranty, as well as a manual overclock. They ran into some issues with the scanner tool and limited success with only increasing the fan speed, unsurprisingly the manual OC provided the best results. That manual overclock managed to hit and maintain 2055MHz on the core, which some noticeable improvements. "We finally got in the RTX 2080 video cards we purchased, and we have been putting those to good use. While Brent is banging out a real-world gameplay preview, I have been seeing just where our RTX 2080 Founders Edition ends up in terms of overclocking. We finally got a solid handle on what our particular Turing GPU and memory are capable of." So It's Nvidia's OC Scanner against AMD OverDrive and whatever the AIB makers have for their Own GPU offerings also. From the looks of it OC Scanner needs more tweaking and its not complied to run cross platform with with respect to AMD and Intel CPUs, different results/issues. RTX 2080 for That MSRP it had better overclock well! Now go and Watch Linus Tech Tips new video(1) comparing SLI to New-NVLink/SLI on RTX as well as Old-NVLink on the Pro Pascal SKUs. Linus has some dual Titan V NVLink results also. That's some interesting results and it looks like consumer NVLink/SLI is a bit different, by design, from Pro Volta/Turing NVLink! That's Nvidia segementing its cosnumer and professional product lines again. Hint: the Pro card NVlink uses all the Dual Cards' VRAM likes it's a single larger logical GPU but not the same for the consumer SKUs where things with NVLink are still more like Old Fashon SLI! "Is NVLink BETTER than SLI??" 'OC Scanner' is just built on the same engine that the other OC tolls are based on (e.g. EVGA Precision et al are basically just fancy reskins rather than actual different programs). All will have the same capabilities for auto-overclocking and voltage curve tuning once updated. The Linus tech tips video was the more interesting part of the post and most of that GPU/CPU over clocking software is either done through some OS API based performance counters for CPUs or some Driver/Middlware based performance counter API provided by the GPU's maker. But really the various different issues reported in the [H}ard|OCP article pointed to Nvidia targeting a specific CPU maker's CPU IP instead Compiling its OC Scanner software to be x86 CPU hardware agnostic as most AIB Performance Monitoring software does. If you watched the Linus Tech Tips video(Do Try to Ignore Linus and his shilling)! Nvidia's NVLink on its consumer SKUs is definitely being segmented into some lower performance tier that gimps NVLink on consumer RTX SKUs to more of a traditional SLI like mode than NVLink's more Mesh like mode that does offer Cache Coherency and Unified memory pools between 2 GPUs that are interfaced via NVLink. And GPU's do appear to like any available memory bandwidth that they can have for those peak bandwidth loads placed upon any GPU by the benchmarking software and some games that can be poorly optimized by their developers. Really AMD with that Semi-Customized Zen/Vega APU on that Subor Z-Plus gaming Console/PC combo device can expect that any Zen/Vega based console games that are optimized for low power Vega Console Graphics will make for some nicely Optimized PC Gaming Ports over to Zen and Discrete Vega GPU based graphics for most gaming titles that have yet to be refactored to make use of Nvidia's Turing/RTX enabled GPU hardware. Nvidia's Tensor Core AI based DLSS/Upscaling and Tensor Cores AI based Denoising is actually the technology that's making Nvidia's Limited "Real Time" Hybrid Ray Tracing mixed with Raster output of use for gaming. So AMD has hopefully been Trying to get Tensor Cores related IP included in Navi for professional AI market reasons, and not consumer gaming reasons also. Vega 20 is sure scheduled to get some AI like ISA Extensions Added to the Vega GPU micro-arch. So maybe for Navi AMD can begin to add at least Tensor Cores capabilities to its GPU lineup's list of features. Looking at so many of even Nvidia's user base expecting improved legacy gaming performance and being angry about getting less legacy games improvement on Nvidia's RTX gaming GPU relative to the improvements the Pascal GPUs got above Maxwell generation. Well that tells me that maybe Nvidia should have upped the maximum ROP counts on the TU102 Base Die. Nvidia could have upped the ROP numbers to say 106 for TU102 instead of 96(Max number of ROPs for GP102 and TU102) and given the TU102 based RTX 2080Ti 96 ROPs instead of 88 and the RTX 2080 88 ROPs instead of 64. And and overall ROP count increase would have increased the Maximum Pixel Fill rates on Turing for legacy games even higher which would have directly translated to a higher FPS metric on RTX/Turing's legacy gaming title performance without the need for any gaming ecosystem delays that are occurring waiting for the RTX features to be adopted fully by the games/gaming engine makers. AMD could with consumer Zen/Ryzen and Zen/Threadripper begin to support its xGMI external Infinity Fabric Protocol interface over any MB's PCIe PHY like AMD does with its Zen/Epyc and SP3 server platforms. And GMI/xGMI is supported on first generation Zen/Epyc platforms for a more NVLink style CPU to GPU direct attached GPU accelerator functionality. Vega 20 is Getting its xGMI support turned on so Zen/Zen2 based Epyc CPUs can interface more directly to any Vega 20 based SKUs via xGMI. And that GMI/xGMI(Infinity fabric) is already made use of on the Epyc MCM and across the Epyc socket on Epyc/SP3 motherboards to more directly and cache coherently interface up 2 Epyc processor MCMs over the PCIe PHY lanes that are switched over to using GMI/xGMI via the Infinity Fabric cache coherent protocol. xGMI(eXternal GMI) is Infinity Fabric based so that AMD's answer to NVLink, that AMD could use between 2 Vega/Navi GPUs(CPUs to GPUs also) instead of XDMA/CF but even Nvidia’s consumer SKUs are getting a gimped NVLink even if Nvidia is trying its best to get some marketing brownie points throwing that NVLink marketing brand name around. Also, that a pure memory OC with no tweaks to power or even fan profile nets even more performance than 120% power + 100% fan with memory untouched. The only reason anyone should buy the 2080 is because that person has enough to buy a 1080ti, but all 1080ti's are sold out.